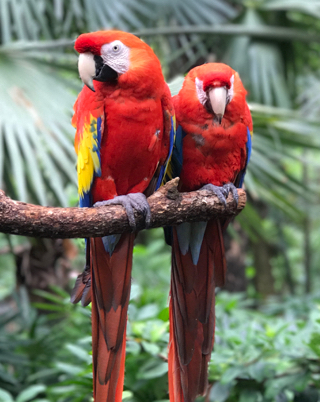 Scarlet macaws are found in The Oasis, which is toward the front of Animal Kingdom. These South American birds can live up to 75 years in captivity, and can mimic human speech. In addition to the ones found in The Oasis, another group of macaws can be seen flying in and out of Discovery Island throughout the day.